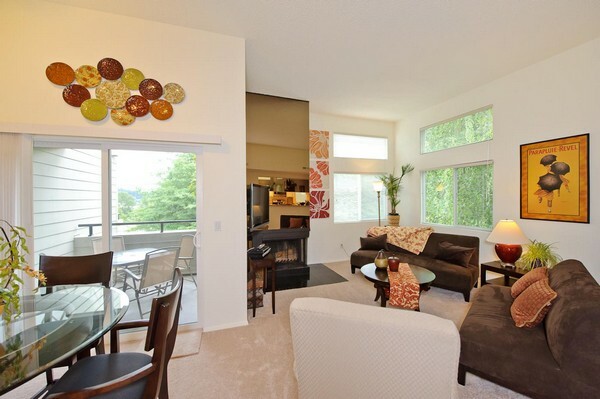 Redmond - 2 Bedroom, 2 Full Baths for short term rental. 30 day stay minimum. Rent pro-rated daily thereafter. Great Redmond location; walking distance to downtown Redmond and Town Center shopping. Easy access to 520 interestate. This quiet, private and spacious 1300 sq ft condo is all on one level and has only 2 stairs to the front door. The vaulted ceilings and abundant windows make it light and airy during Seattle's darker days. All linens and housewares provided. Fully furnished and appointed. Just bring your suitcase!